The BoBunny Blog: Elegance With Foil Rubons! Hello everyone! The Garden Journal Collection is the perfect collection to create a mini album for the gardener, to display the wonders of a floral garden. The Gold Alphabet gives the album the old world richness of leather covered books embossed in gold. The Gold Alphabet rub-ons allowed me to create that look. The gold rub-ons are so rich that they look like gold leaf embedded in the paper. They are so easy to use and rub on with perfection. To enhance the gold, I created a jeweled closure using gold jewelry finds and seam binding, that were strung through pink wide eyelets that were set in the cover. I also edged the album with Gold glitter paste. No garden is complete without butterflies. On the back of the album, I used modeling paste with the stencils doing floral corners and the 3 smallest butterflies down the middle. On the inside of the album there are 6 large envelope/sleeve pages that each contain a journaling card that slips into the sleeve. On a few of the pages as in this one, there is a pocket on the sleeve itself that holds tags and additional cards. 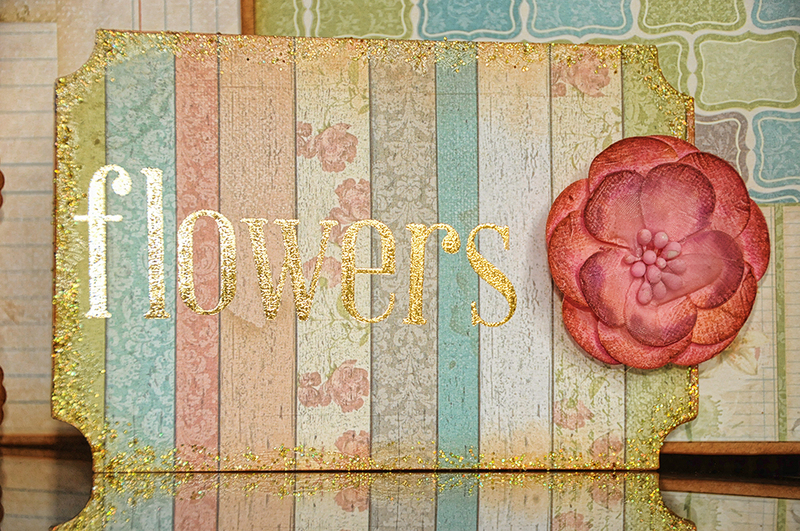 I used the Gold rub-ons to spell the word "flowers." The gold throughout the album is a little treat to add to the elegance. This is a closeup of one of the cards in the album that feature the Gold rub-ons. These are 2 of the 6 cards that were pulled from the sleeves. The lined pattern on the Delight paper was perfect as you can use these cards to journal on. The opposite side of the cards have patterned paper and plenty of room for photos. They slide easily back into the sleeves. The top of each fold on the cards I placed a button. Once the button was adhered to the fold, I used my Cropodile to punch a holes over the existing holes and placed a piece of string through and tied a bow. Thank you for joining me today. I hope that you are inspired to use the Foil rub-ons to add that special elegance to your next project. I adore this mini! I want to make one now!